Arrived Arizona! Getting settled. Laundry day tomorrow- 9 days on the road! Flannel sheets we had on bed coming here are off and the cotton ones are on- especially with 80 degree + weather. 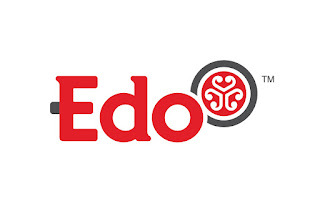 of the Edo Japan Gift Card Giveaway! Winner has been contacted and has 7 days to reply before a new winner is selected.. Happy Halloween Everyone! 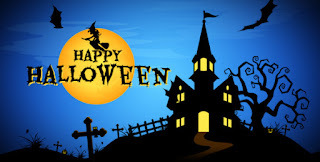 No trick or treaters for us today as we are all the way out in the desert. 2, 697 miles! Weather here is warm- suppose to be 27 degrees today! EarthFresh is a Canadian produce company specializing in supplying the retail and food service industries with premium fresh potatoes, carrots and onions. We had the opportunity to review some of their FINGERLING GOURMET POTATOES and were very impressed - the "gourmet" in the name definitely fits!! The potatoes were great, we could really taste the freshness and high quality with each bite. Aside from the potatoes themselves, we really liked the innovative light blocking bags which keep the light off the potatoes – preventing them from greening and keeping them fresher for a longer period of time!! 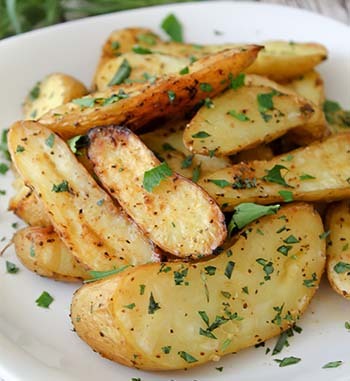 We would definitely recommend EarthFresh potatoes - check out their website for other products, recipes and more!! Bodie State Historic Park and Ghost Town, Ca. Missed this place last time we came south, but was nice to be able to make it through this time-Bodie State Historic Park and Ghost Town, Ca. There are only about 5 % of the buildings remaining from a town that boomed in the 1877-1881 period. The town, what remains, is now in a state of "arrested decay". Bucket list- Ghost Town Visit! Windy there today and suppose to snow tomorrow but sun was shining at least today.13 mile drive to get there from the highway, about 8,000 elevation and some dirt road, so we left the RV about 3 miles before the dirt road, unhooked the SUV and took Jakey with us as well. Dogs are permitted and other dogs were there as well. $8 per adult admission fee. Were in the park about 2 hours just walking around. Whether they've been naughty or nice, your pets provide loving companionship all year-round. To keep playtime new and exciting for your furry friends, and to provide them with the best in pet products, chose Hagen for all your furry and small pet needs this holiday season. 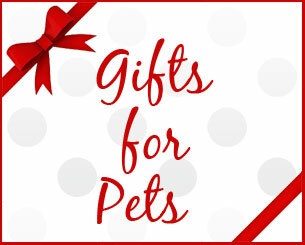 *** Watch this spot for more great gift ideas for those great pets! 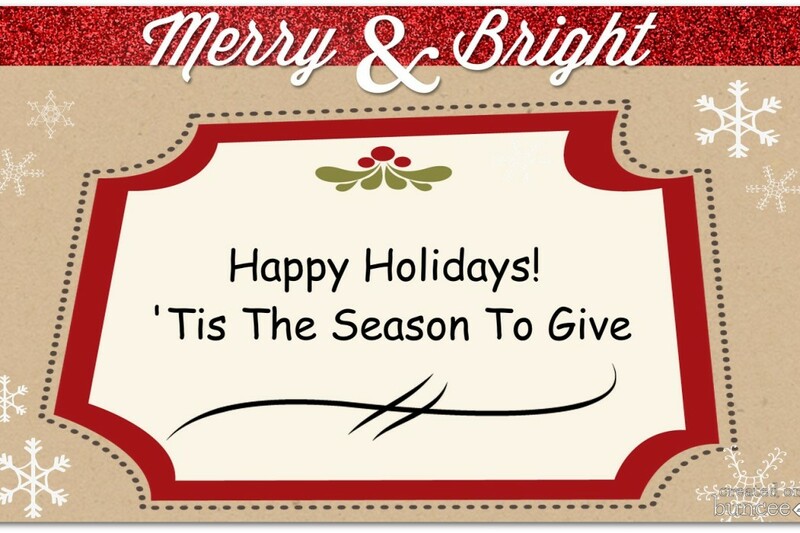 The holidays are often a season for giving, not just to friends and family but also to people in need. Whether you give a donation to a nonprofit in a friend's name or pick up a trinket crafted by artisans working in developing economies, there are no shortages of options for the shopper in search of a present that has a social impact. 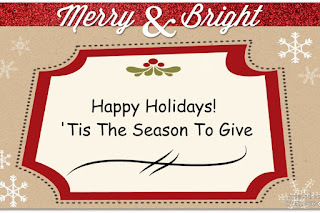 We ask this year that you also give a gift that supports a charity as well. The EOD Warrior Foundation is a nonprofit organization whose mission is to improve the quality of life for the EODfamily by providing emergency financial relief, scholarship opportunities, physical, social, and emotional support. To learn more about the EOD Warrior Foundation, or see their fundraising events calendar, visit their site at: www.eodwarriorfoundation.org. Tackitt Family Vineyards is owned by a retired naval officer and his family. 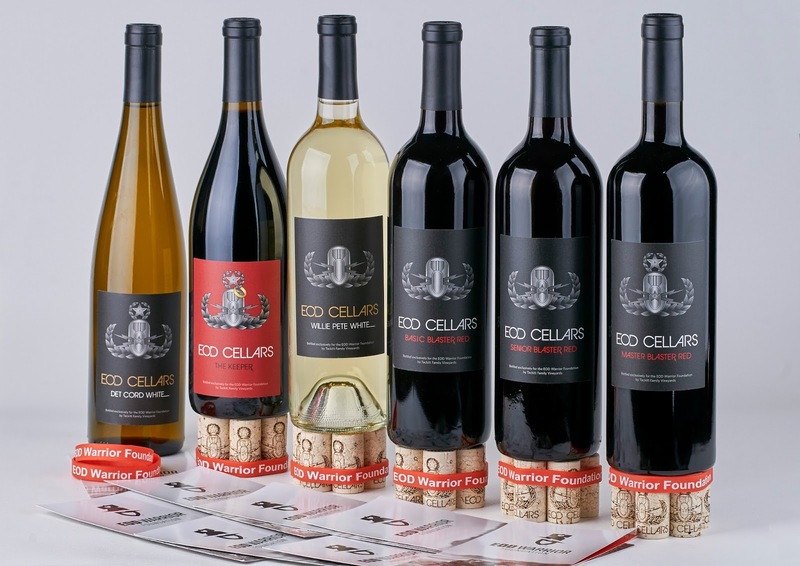 A line of EODwines are available at Tackitt Family Vineyard, including Basic Blaster Red and Det Cord White. 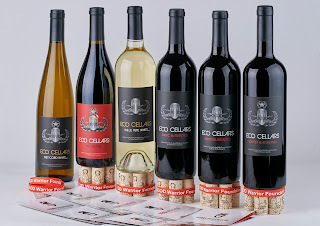 A portion of the proceeds go to the EOD Warrior Foundation, that honors fallen EOD warriors and provides assistance to wounded EOD warriors and the families of wounded and fallen EOD personnel. 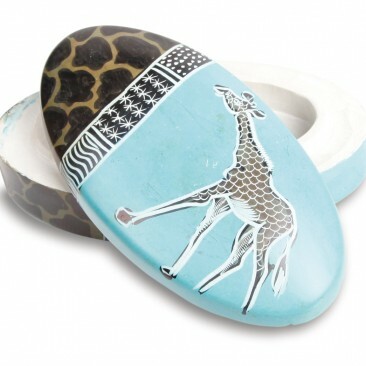 This African Soapstone Box is a great gift. This ornate hand-carved soapstone box is etched and designed by local artisans in Kenya. Using this sustainable resource these artisans are lifting themselves and their families out of poverty. 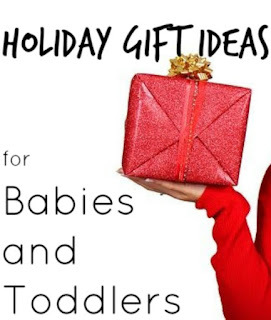 **Watch this spot for more ideas for gift giving and supporting charities at the same time! Road trips, gas stops, no time for lunch; we’ve all found ourselves at the convenience store for a fast bite on the go. While a bag of chips or chocolate bar may be an option we later regret; there are fast bites that can actually offer some health benefits. Dr. Christopher Calapai a board certified expert in osteopathic medicine specializing in longevity offers some junk food options to consider the next time there’s no time for an actual meal. Don’t get the blues about all food dyes. From candy to sports drinks, the unnatural colors of foods today can make you cringe at the thought of what’s making them colored. But, not all colored dyes are as bad as you may think. Research done by scientists at the University of Rochester found that Brilliant Blue G (BBG), found in blue M & M’s and blue Gatorade, could help reduce damage from spine injuries. When BBG was injected into lab rats with spinal cord injuries, it sped up their recovery time and ability to walk. 2. Cheeze Whiz?? No way!! Fat isn’t always a bad word. The FDA has stated that not only are all trans fats not bad, some are actually good for you. Conjugated Linoleic Acids (CLAs), although high in calories can help fight cancer, weight gain, diabetes and arthritis. It’s hard to believe, but CLAs are found in Cheese Whiz. Just the words pork rinds sound like instant heart attack. However did you know they are a fantastic source of protein? A one-ounce serving of this fried snack has seventeen grams of protein, seven times the amount of found in a serving of potato chips. Plus, 43% of the fat found in pork rinds come from oleic acid, the same healthy fat found in olive oil. Some studies have found that beer can actually help increase bone mineral density because it contains silicon, making bones stronger and less likely to fracture. A Harvard University study found that beer could prevent blood clots and reduce the risk of stroke. Italian researchers found that beer can raise HDL, the good cholesterol in your body. Opt for a light beer with fewer calories to avoid that full feeling. They are the next best things to cookies if you’re trying to keep your health in mind. Graham crackers contain much less sugar than regular cookies and are still sweet enough to satisfy a craving. Plus, they are made with flour that undergoes a special milling process, preserving more of the whole wheat than in usual milling. This is a snack that gets two thumbs up. Popcorn is packed with fiber and polyphenols, which are antioxidants that help to protect us from heart disease and certain cancers. Surprisingly, popcorn has more iron than eggs and spinach! 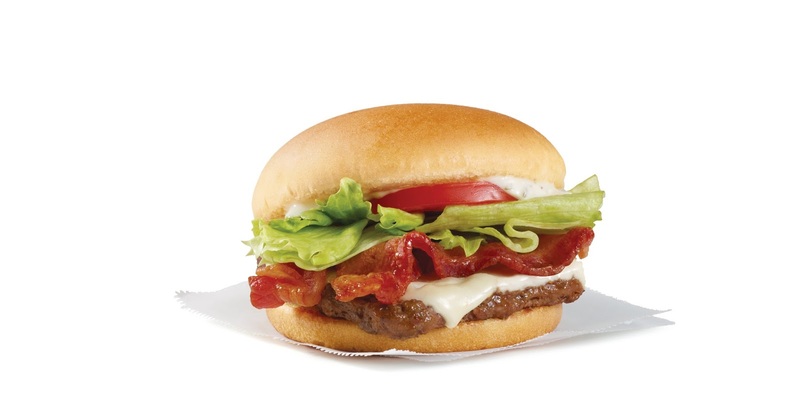 It is also gluten-free, which makes it an option for those with Celiac Disease and other gluten allergies. Lastly, popcorn is mostly air. This means it fills you up, helping to stave off hunger cravings. Forget about the leather-tasting jerky of years past, today’s gourmet jerky is delicious and can be healthy. Beef Jerky, just like its non-dried version of meat, is high in protein, iron and zinc. It, also, contains heart-healthy monounsaturated fats. Be sure to look for natural beef jerky as the newer gourmet styles that are packed with flavor and free of nitrates. I sure find it easier to plan ahead on our RV trips now on where we are planning to stay for the night than scrambling last minute, and pulling into town at dark, and then having to find a place to stay. Last night we stayed abut 7 miles outside of Shelby at a campground called Williamson Park Campground. Was in a wooded area at the end of the road.. no one else staying there, deer running around when we got there, and very secluded. There is someone that lives there though, since we registered when we first came in beside a trailer, and left $10 in an envelope, and deposited into a box nearby. There is bins for garbage, but no other services.Garbage truck came through in the morning. We could get satellite out here but I couldn't pick up a signal on my cell. We drove back through town this morning and pulled into the Comfort Inn campground that we once stayed at before, and filled water and did sewer dumps at one of the sites. No one there and registration to stay at the campground is at the bottom of the hill at the hotel..so no one paid any mind to us. I might add as well they have free WiFi in the campground, but Gerry was eager to get on the road and wasn't going to wait for me to be doing emails-haha.. so now back on my Verizon and on the road again towards Butte or Dillon, Montana. The Buddy Bib is a 3-in-1 sensory teething toy and bib! It is a new and creative combination of a lovable plush sensory toy, a BPA and phthalate-free food-grade silicone teether and a soft, absorbent bib. The plush sensory toy can be affixed anywhere, making baby’s teether or soother accessible while preventing it from being dropped or lost. Bold patterns, bright colors, and crinkle sounds provide added sensory stimulation while the soft, absorbent bib keeps baby’s skin and clothes dry. When the Buddy Bib gets drool-filled or dirty, simply throw it in the washing machine for easy cleaning! 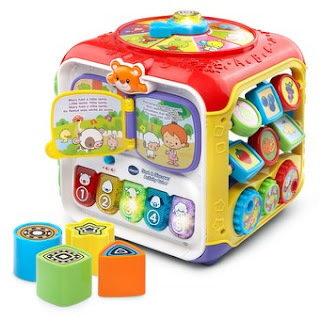 The Sort&Discover Activity Cube™ by VTech® is five sides of fun! Your little one will love exploring seven fun activities and two electronic panels that introduce colours, numbers, animals and more. Turn the book page, twist the spinner and slide the animals to develop fine motor skills. The activity cube also develops hand-eye coordination with the shape sorter and colourful shape blocks. Sweet Dreamz On The Go is the all-in-one baby soother to calm fussy and tired babies: a must-have for the modern, busy family. Each adorable character will feature eight soothing sounds and melodies, including a Mother’s heartbeat and a popular “shh” sound while their faces will light up with a soft, soothing amber glow. A built-in sensor works to reactivate the soothing sound whenever baby wakes. 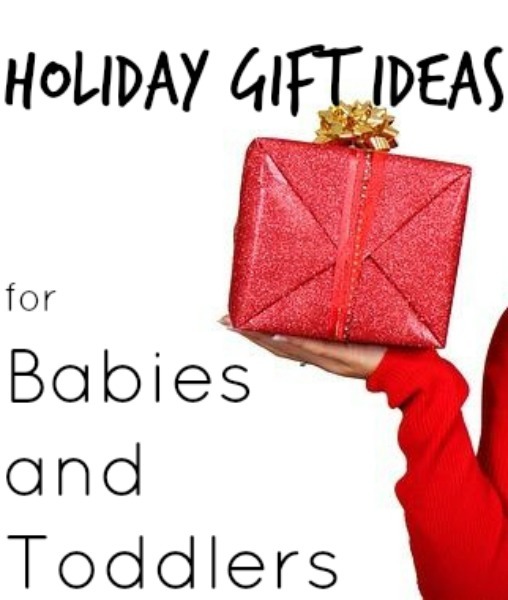 **Watch this spot for more great gift ideas coming soon! While visiting with family on our travels through Calgary, Alberta, we decided we`d have a pizza night for supper. Something we could order, #RandomActsOfPizza , pick up and go back to Erika and Jon`s with. Since neither of the 4 of us had eaten at a Panago Pizza before but heard of it, we made that our choice, from one of their many locations here in the city. Panago is a Canadian pizza delivery and takeout chain with over 190 locations across 7 provinces. Ordering was easy too. We went online to their Panago Pizza website and ordered by phone calling a simple number that has friendly staff taking your order for the pick up location you need. Picked up the order in 15 minutes and we were on our way. 1) Chicken Souvlaki Pizza – Limited time only pizza with fresh passata tomato sauce, souvlaki grilled chicken, red onions, green peppers, Kalamata Olives, tomatoes, mozza + feta. 2) Mediterranean Wings – Limited time only. Our newest wing flavour creation is the perfect trip to the Mediterranean for your tastebuds with the perfect blend of oregano, garlic and a hint of lemon. Panago Pizza has fresh and nutritious food. They are all about authentic, chef-inspired cuisine that goes back to the simple basics of what food was meant to be. They create the finest flavours and source the highest-quality ingredients. Panago stands behind every one of their hand-crafted recipes as well. Plus no added MSG, no artificial flavours, or nasty colours! It’s as simple as that. We loved everything and all had seconds! Panago Pizza would love to giveaway to one of our lucky readers a full meal deal to include: 2 med pizzas, 2 salads, a 2L pop + cookie. (Please be sure to leave your contact info in case you win- as we`ll need to contact you). Stopped early for the evening- Drumheller , Alberta- Walmart. Free overnight allowed- and Free Wi-Fi! Next stop tomorrow, Calgary, Alberta to visit with the kids. While grocery shopping this Fall, Kellogg Canada and The One Income Dollar would love to let our readers know about their Kellogg's Rice Krispie Rainbow cereal bars,new in stores and great for home or to hand out to those special trick or treaters at your door this Halloween.They are quite pretty! As well Pringles is great with their Halloween portioned packs this year. And a great start to any breakfast this Fall is their new Mini Wheats Pumpkin Spice flavoured cereal. It's something new and with a Fall twist when pumpkin flavoured this and that is all the rage! We also asked if we could even have something for our dog and they were able to oblige with some chicken strips fried on the grill. We ordered the Noodlefull beef bowl as well as food for tonight's supper- and took back to the RV to eat. We frequent Edo Japan when there are ones on our travels and highly recommend if you haven't tried them to try them out. There is also an opportunity here to win a $25 gift card from them, by entering our giveaway below. A random draw will be held by Random.org on October 31, 2016 from all entries received. Canada only. As well, please leave a way we can contact you if you are a winner. Left home yesterday around 1 pm- wanted to wait till Friday's mail had come in- was expecting some packages and such, so glad we waited, but it was dark when we got into Saskatoon, Sask. last night. Overcast and frost on the grass this morning. We stopped for gas to refill 20 minutes outside of Saskatoon that costed $200. A free camp spot was what we needed after paying that for gas, so nice that Cabela's allows overnight stays in their lot here. There is no snow here at all in Saskatoon,not like back home where we have 2-3 feet already. The road to get here was a 7 hour drive with RV, all clear. Just getting everything secured again and off towards Drumheller, Alberta - where it's a 4 1/2 hour drive to get there. The Le Marais cookbook - "Le Marais: a Rare Steakhouse, Well Done.". Available on Amazon. It reflects the story and central challenge posed to the restaurant's owner and chef: how do you take traditional, non-Jewish food that you have learned to cook your whole life, and rework it in order to fit all the Jewish dietary laws. The owner, Jose, is of Portuguese origins, and his chef is Italian and Irish-American. The cookbook is a reflection of their recipes with a kosher twist. 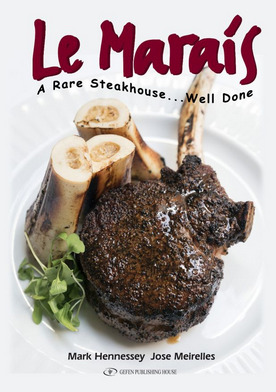 The main purpose of the cookbook is to show how Le Marais can combine authentic haute French cuisine with the Portuguese and Italian flair of the owner and chef. A perfect book for anyone who loves to cook! 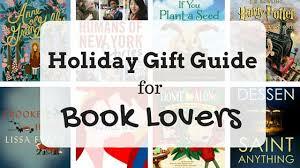 ** Watch this spot for more great book suggestions for your holiday gifting. 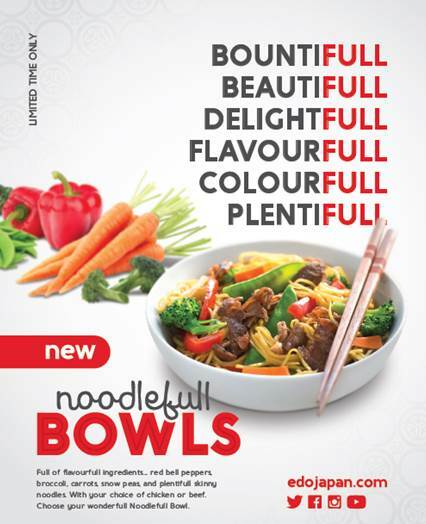 Edo Japan is excited to introduce their wonderful, flavourful Noodlefull Bowls, available for a limited time. Enjoy these bountiful, beautiful, noodlefull meals before their gone! Featuring a colourful array of premium vegetables and Edo’s signature sauce, these tasty treats are sure to tingle your senses! Noodlefull Bowls will be available until November 7. Edo’s Noodlefull Bowl consists of ramen style noodles, premium veggies, the choice of chicken or beef, and is topped with Edo’s signature teriyaki sauce. The premium vegetable mix consists of snow peas, broccoli, and thick cuts of red pepper and carrot. However, customers can also choose a no meat option and get a second serving of the premium vegetables instead. For protein lovers, there is an option to add shrimp, or double the meat serving of chicken or beef. For some added spice, customers can also add Edo’s complimentary chilli sauce to their bowl. Gerry and I love this place! The food is to die for! !